Searching for a tool when you needed it the most is one of the most frustrating experience for every mechanic and DIYer. Most mechanics are careless on how they store/keep their tools, only to start looking for it during repairs or maintenance. All this problem can be solved if you invest in a toolbox that can house all your devices. This toolbox allows you to keep your tools organized practically eliminating the need to spend minutes searching for a particular instrument. If you plan on getting your repairs done quickly and efficiently, then it’s essential you store your tools and keep it well organized. The rolling toolbox will do just that while also being easy to move around. With so many options in the market, we decided to research and review all the top selling products. The review below is designed to guide you in getting the best product in the market. 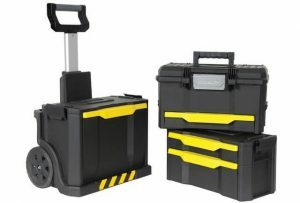 After several types of research, we can boldly recommend the BOSTITCH BTST19802 Rolling Tool Box. To keep things easy, we have compiled reasons why the product is the best in the market. The Bostitch Rolling Tool Box is an excellent option for mechanics and home users who plan to keep their tools in one place and also have the ability to move them around to somewhere else. The box is designed into two separate detachable compartments. The first large drawer is designed to house heavy and more extensive tools like saws and drills while the second drawer is designed with several trays to keep the smaller items in place. Each compartment has enough space to store all your tools and keep them in place. The Bostitch BTST19802 tools are comfortable and convenient to access thanks to the detachable compartment and the drawers’ ball bearing slides. To ensure maneuverability in good and rough terrain, the Bostitch Toolbox is equipped with full rubber wheels. It is quite easy to store heavy tools and small hand tools. Apart from storing your tools, some users claim to use the rolling box to transport other materials like hairdressing equipment and audio recording gear. That being said, with a storage capacity of ten gallons and a load capacity of seventy pounds, there is enough space for your hand tools and other items. Users will undoubtedly be delighted for getting value out of their money. The Bostitch Tool Box was designed into two different storage units. The top part is designed to store and hold smaller tools in place with a drawer moving on ball bearing slides for convince. The top part can be detached easily using the side latches. Meanwhile, the other part of the box is best for storing heavy and more substantial tools. Accessing the tools is not a problem while storing them is the easiest part. One outstanding feature of this box is the separate handle for each compartment, making it easy and comfortable to carry if the box is detached. Both storage units are spacious with enough room to hold many standard tools including the smaller equipment. The top part is designed with multiple trays to store smaller items while the other part is just flat and spacious to hold the heavy tools. The Bostitch Tool Box offers more for customers than any other product on the market. The product comes with 7” full rubber wheels to ensure you have no difficulty when rolling especially on bad terrains. Generally, the rolling toolbox makes repairs and maintenance convenient for users. The box features a strong ball bearing slides for easy removal of tools. Also, the product height is ideal for every user better than other rolling tools in the market. Duplicate handle the top tool box, easy to carry. Can be split into two separate parts. Has a huge load capacity of up to 70 pounds. 7-inch Rubber wheels can roll over any surface. Suitable for any working environment. The plastic body isn’t much durable. The Bostitch Tool Box is one of the best tools in the market at an affordable market price. 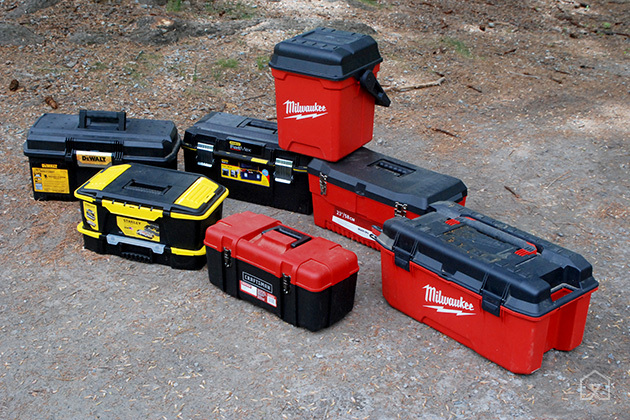 The product top box is detachable with a separate lid to transform the box into two different toolboxes. The drawers make storing of equipment quite easy and smooth to access. The 7-inch Rubber wheels can roll over any surface. The Bostitch Btst19802 design adds numerous advantages to the product. The product is worth buying.